On Tuesday Donald Trump managed to drag himself away from his luxury Mar-A-Lago Resort in Palm Beach, Florida. He ventured all the way to Wisconsin to visit the Snap-On Tools facility in Kenosha. And it’s taking every bit of self-control I have not to make a joke about Trump being a snap-on tool. The purpose of the visit was to disgorge some prefab propaganda about how concerned he is about creating jobs. The first order of business was another of his patented reality TV ceremonial Executive Order signings. This one was ostensibly to encourage more buying of American products and hiring of American workers. However, anyone who has followed Trump’s business dealings knows what a hypocritical crock that is. Most of the products he and his family make are manufactured in China or other overseas factories. What’s more, he routinely hires foreign workers at his golf resorts and wineries. 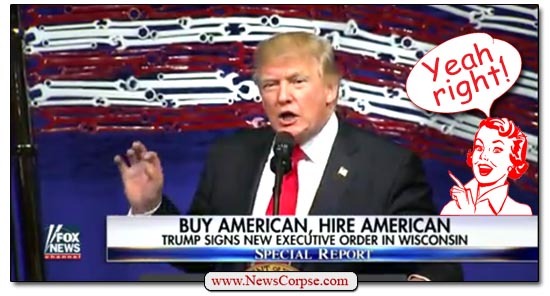 The Executive Order that Trump signed is as phony as his pledge to buy from and hire Americans. It doesn’t actually have any direct effect on these matters. It merely initiates a series of reviews and proposals for reforms. But if patriotic citizens want to do their part they can simply boycott all Trump products and properties. That would do more to advance the cause of American jobs than this contrived and useless photo-op. It seems like a lifetime ago, but Donald Trump’s campaign for president ended on election day just five months back. It was a surreal undertaking that included vulgar recordings, racist endorsements, and relentless media bashing. And the repercussions from that campaign are still being felt. A fixture at the many rallies held by Trump was the ever-present air of hostility. Violence always seemed to be on the verge of breaking out. Protesters courageously attended the cult-like affairs despite the open threats they faced. And on several occasions Trump’s minions did assault them. In one of those incidents the victims filed a lawsuit against both the perpetrators and the Trump campaign. Bamberger may have a case. The charge that Trump “urged and inspired” violent activity is easily proved. Trump repeatedly used overtly provocative language aimed at protesters. For instance, he once said that he would like to punch one in the face. He explicitly advised his followers to “knock the crap” out of other protesters. He reminisced about some longed for past when people exercising their right to free speech were “taken out on a stretcher.” And he approvingly spoke of a protester who had been beaten saying that he deserved it. 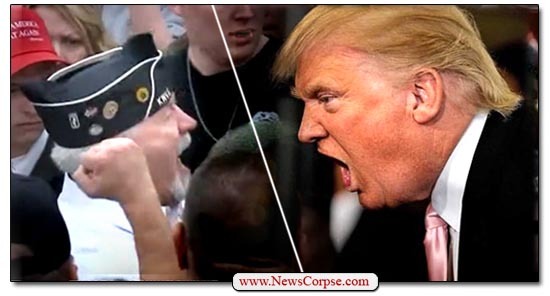 Even more incriminating was Trump’s promise that if his supporters attacked a protester they wouldn’t have to worry about the legal consequences because he would “pay for the legal fees.” That’s more than an incitation to violence. That’s a purposeful solicitation to commit an criminal act. Consequently, Bamberger had a reasonable expectation that Trump would back him up were he to knock the crap out of a peaceful protester. Trump is making a multi-pronged defense. First of all, he claims that his exhortations to “remove” the protesters were not directed at rally attendees, but to security personnel. That’s a specious argument since he never made any such distinction. What’s more, his bombastic rhetoric wouldn’t be appropriate for responsibly policing crowds either. Secondly, Trump claimed to have immunity due to his position as president. That, of course, was settled long ago when the courts found that President Clinton could not use that argument to avoid litigation over his alleged sexual misconduct. President’s are not above the law, and any allegations not related to their official duties are actionable. Since the allegations in Bamberger’s suit occurred before the election, Trump cannot evade legal responsibility. And in the end, neither can Bamberger. While Trump could be found to have “inspired” the assault, Bamberger alone is responsible for carrying it out. It’s not as if he didn’t have a choice. So Trump’s liability would be to the victims, not to Bamberger. However, the spectacle of a president being held to account for such inspiration is disturbing, to say the least. It speaks to the brutish tendencies of a dangerously unstable so-called leader. And it is sadly emblematic of the petulant character of Donald Trump and the hostile environment he has created ever since he stepped onto the political stage.